(Top row, L to R) Ariel A. Torres ’11, Vrajesh Y. Modi ‘11, and Ian P. Tracy ’11 will be running for the position of Undergraduate Association President. Their running mates are (bottom row, L to R): Jarrett R. Remsberg ’11, Samantha G. Wyman ’11, and Pall M. Kornmayer ’11, respectively. The end of Northwest Shuttle? MIT is considering shutting down the Northwest Shuttle service, which runs between the MIT graduate dorms north of Vassar St. and west of Massachusetts Ave. and the main academic buildings. 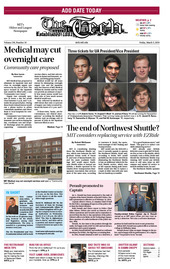 MIT would expect Northwest Shuttle riders to instead use EZRide, a shuttle operated by the Charles River Transporation Management Association that services most of the same area, according to Lawrence R. Brutti, the operations manager of MIT Parking and Transportation. Jay A. Perault has been promoted to the rank of Captain of the Patrol Division of the MIT Police. Perault’s promotion is effective as of February 10, 2010. The MBTA will stop using two employees to run each Orange Line train, part of a plan approved by the agency’s board Wednesday to balance next year’s budget without raising fares or cutting service.